Paul A. Trapp was born in Benton, in Butler County, Kansas on 4 DEC 1910, third child and second son in the family. His earliest years were spent near Richards, Vernon County, Missouri where his father and Grandfather Trapp worked the family farm. Early in 1916, his parents moved to Hanford, California. His mother's parents and siblings were already living in that area. His father was hospitalized shortly before 1920, and his mother was left with five children at home to care for. He left high school and joined the Navy at an early age. 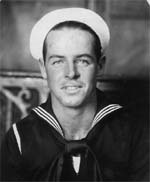 By the 1930 CENSUS (taken April 12) he was 19 & already a Seaman in the Navy & Living in the C-2 Barracks in San Diego CA. Sometime between 1930 and 1933, he married Dolores J. DICKSON. They later had two children. Paul was stationed in Hawaii when Pearl Harbor was attacked. Going through my late mother's old albums, I find him on or near the USS West Virginia. Since the snapshots are undated, I can't be sure that Paul was assigned to her before the sneak attack or if he was re-assigned after she was restored to battle readiness. Perhaps the pictures will offer a clue. I do know that Paul remained in the navy throughout WW II and the Korean War as well. I'm told he rose through the ranks to hold the highest possible non-com ranking. During the Cold War, he was on ships that took part in A- Bomb tests out in the South Pacific. He finally retired in the early 1950's, probably around 1954. I hope that other, closer, descendants can add to or correct what small information I have. But there aren't many left, & I haven't been able to contact any lately. Will keep trying. But I want to see Uncle Paul given the recognition that he and all who served during those times deserve.